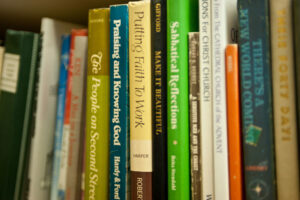 Begun in 1980 to house Father Foland’s extensive library, the Howard Lane Foland Library provides a library for scholars of the Church who wish to devote themselves to study of a particular Church-related subject or who want research materials close by as they write for or about the Church. We invite you to visit the library, which houses more than 15,000 volumes, covering all aspects of the Church. Two comfortable study areas make the Foland Library the ideal place to conduct research or browse our extensive collection. To contact HILLSPEAK for more information, please contact us online or call 479-253-9701.